For milling and cutting brittle lightweight materials, new solutions such as resonant systems from Weber Ultrasonics and Hufschmied Zerspanungswerkzeuge shorten processing times, extend tool life and improve accuracy by using significantly reduced process forces. With these systems, milling work done by industrial robots remains within tolerance ranges similar to those for machine tools. 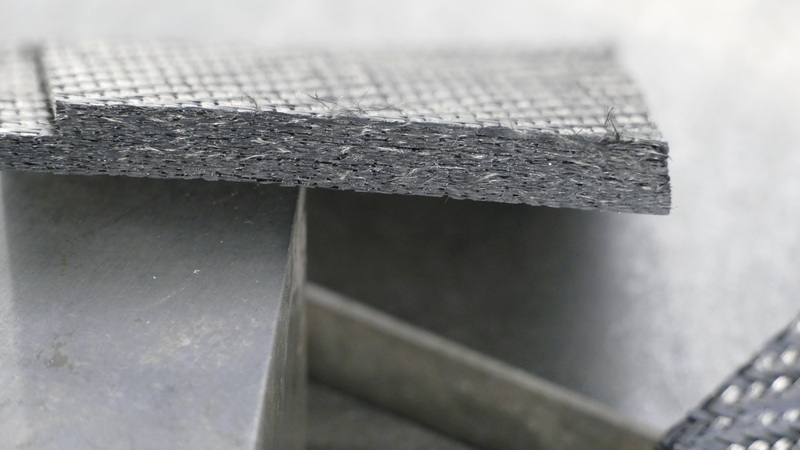 The use of lightweight materials such as fiber-reinforced plastics, composites and stacks with cores of foam or honeycomb structures demands frequently modified processing solutions. Ultrasonic systems for milling, cutting and sawing provide adaptable and efficient processes. Non-resonant systems generally used today convert only about five percent of input energy into vibrations. In contrast, the resonant ultrasonic systems jointly developed by Hufschmied Zerspanungssysteme GmbH and Weber Ultrasonics AG achieve an efficiency rate of 90 to 95 percent. Among other things, the systems use significantly reduced process forces. In the processing of glass fiber and carbon, for example, the material removal rate is higher, resulting in higher material throughput and reduced machine working time. In addition, the tool life is increased through decreased strain or deformity of the tools. Processes are thus made more efficient. Greater processing accuracy also can be achieved in ultrasonic milling with the new resonant systems. Delicate workpieces, for instance, can be manufactured with gantry systems. Furthermore, it is possible to use industrial robots as economical and flexible alternatives for the implementation of an automated production process. The feasible production tolerances lie within the relative accuracy range of classic machine tools. Weber Ultrasonics AG develops, produces and markets solutions and components for the industrial use of ultrasonic technology. Its business field focuses on cleaning, welding and cutting with ultrasound and also includes other special applications. The Group, which is DIN EN ISO 9001 certified, has won several awards for its exemplary management. The family-run medium-sized business with headquarters in Karlsbad (Germany) employs a staff of 130 around the world. Weber Ultrasonics AG owns a subsidiary in the USA and Weber Entec GmbH & Co. KG headquartered in Waldbronn, which specializes in ultrasound-based systems technology for biogas and wastewater treatment plants. Hufschmied Zerspanungssysteme GmbH has more than 25 years of experience in development and manufacture of process optimized tools. Because of the early focus on machining plastic materials, fiber-glass reinforced materials and carbon fibers Hufschmied attained a top position in Europe for chipping/milling of new materials. In 2016 the company was nominated for the BMW Group’s Supplier Innovation Award and honored in the Production category. Hufschmied is a medium-sized, family-run company with headquarters in Bobingen. Our customers are among the international giants in the high-tech industry. From Airbus and Audi to BMW, Mercedes and Porsche, they all rely on the process-optimized tools from Hufschmied for the processing of new materials. Hufschmied impresses its customers with its extensive application knowledge, expert process consulting and high-quality products for economical machining processes.